The Mulligan® product line comes in three different sizes and shapes. Made in the USA, the Mulligan® is an injection molded part used to reinforce rough cut openings in drywall. The Mulligan® can be easily installed using joint compound to cover the piece and provide a perfect finish. 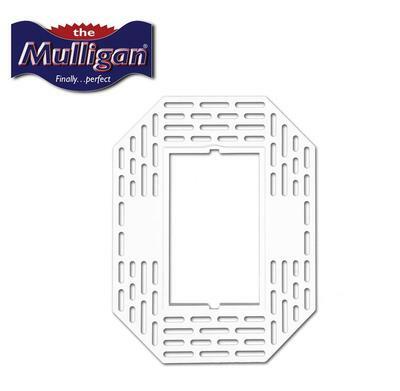 The Mulligan® can be used in new construction to increase the fire rating around outlets and switches. The fire retardant PVC reduces the speed of electrical fires from entering in through the drywall opening. Also reduces draft around electrical cut outs, therefore increasing the weatherization or insulation value. When the Mulligan® is used in repairs or remodeling applications, it increases the quality of the finish work, while reducing the labor time to achieve it. Always better than tape alone. Makes for a perfect job every time, eliminating costly call backs. Designed for use with plastic or metal “new work” boxes, and will work on most types of “old work” boxes. Electrical Finishing Frame for “Single” Gang Cutouts was designed for electrical boxes around light switches, outlets, cable and phone jacks, as well as timers. Electrical Finishing Frame for “Double” Gang Cutouts was designed for electrical double boxes around light switches, outlets, cable and phone jacks, as well as timers. Electrical Finishing Frame for “4.5” diameter Round” Gang Cutouts was designed for electrical boxes around recessed lighting. The quality of workmanship you will achieve from using The Mulligan® Electrical Finishing Frame for Gang Cutouts will make it difficult to continue using tape. It’s day and night from one finish to the other.